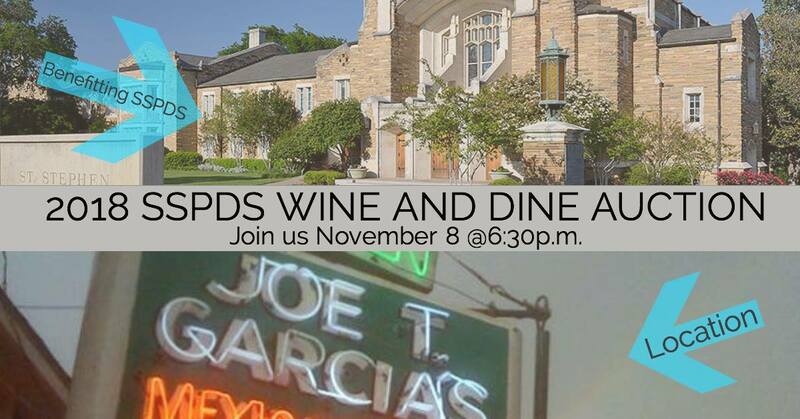 “Party on the Patio” with us for the 12th Annual St. Stephen Presbyterian Day School Wine and Dine Auction ! We’ll have silent and live auction times as well as some large raffle items! The Spring 2019 Primo Parking Spot will be raffled off too. Bring yourself, your spouse, friends, caregivers (anyone but the kids!) and enjoy live music, DJ, live music by Doc Wesson, food and drinks. We’ll have some GREAT Christmas gifts – so come ready with your cash, checks and plastic! Tickets purchased before October 31st are $45 and after that they are $55 – SO GET THEM EARLY! The money raised this year will be used to enhance the children’s new outdoor learning space, strengthening our existing security system, and to provide continuing education for our teachers and staff. This benefits our Day School children and also, the many St. Stephen Presbyterian Church children and neighborhood kids who take advantage of our events such as our Spring Festival, Vacation Bible School, Music Camp and Christmas on the Hill.